There is an ancient story found in the Prashna Upanishad that tells of a debate between prana (“life force”) and the five senses as to which of them was most valuable for human survival. The eyes claimed that without them, people could fall and be injured. The ears claimed that they could help people hear sweet things, as well as alert them to dangers the eyes could not see. The sense of smell argued that one could live without seeing and hearing, so long as one could still smell the richness of the world. And so it continued. Then prana spoke up, expressing that without itself, none of the other senses could do their jobs. The other senses did not believe this. So, to demonstrate, prana began to leave the body, causing the five senses to grow weak. Quickly realizing the truth that prana reigns supreme, the five senses apologized and bowed down to the significance of prana. According to the yoga tradition, prana not only rules over the five senses, but also over the whole body. It is prana that allows us to experience life. 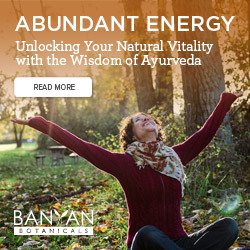 It’s said that if a part of the body is not functioning well, it is likely deficient in prana. Prana is the energy that rides on the breath. It is sometimes mistakenly referred to as the breath itself, but we are often breathing, while still lacking life force. It’s what we do with our breath that either increases or decreases prana. Most of us do not “breathe into” our entire body. We often only expand the upper chest (missing out on the depth of the breath). Or we expand the lower belly but do not allow the upper abdomen and rib cage to expand as well (thus missing the height). Most of us “breathe into” the front body, missing the sides and the back. In other words, we end up breathing into regions of our body, and not filling the whole. This happens because it is quite difficult to take a deep and full breath— it’s a bit frightening, and stress and past trauma can make it hard for many of us to access our full breath. We suffer with the tension caused by a fast-paced, stressful life, which often leads to shortness of breath (and even an unintentional holding of the breath). When we begin a yoga practice, one of the first lessons we learn is to breathe in and out through the nose. This is quite contrary to the way we breathe when we work out at the gym, which is often in through the nose and out through the mouth. In the style of yoga that I practice and teach, the next thing that we learn is ujjayi (victorious breath) which requires us to not only breathe in and out through the nose, but to also apply a slight constriction in the back of the throat so that the breath is more contained, controlled, and effective. Ujjayi feels like a thick whisper moving in and out (one might also say you sound like either Darth Vader or the gentle waves of the ocean). Once ujjayi is introduced, the challenge is to maintain it—both on the inhale and the exhale, and throughout the duration of class. This means to maintain a calm, controlled, and even breath regardless of whether you’re doing something extremely challenging, or simply sitting still. That’s the idea, but many of us are so busy focusing on simply keeping up with the pace of a class and trying to figure out which body part goes where, that we forget to pay attention to the flow of our breath. And if we attend classes that play music, especially loud music, the awareness of the breath can often fade into the rhythmic and booming playlist. The ability to hear or even feel one’s breath is no longer part of the practice. We often leave a class drenched with sweat and exhausted, and it can feel good to surpass our former limits, so we go back for more. There is a problem, though. If yoga means union, and the practice of yoga was initially developed to bring us more in harmony with ourselves (through the linking of mind, body, and breath), but we leave a class completely wiped out — then we are not in harmony. By the end of a challenging class, it’s often not only the body that’s exhausted, but our minds may also feel beaten to a pulp. We could end up more fragmented than when we came in, feeling better only momentarily because of increased endorphins and sweat. But when our energy is drained after a strong class, we’ve wiped out a lot of our prana. And if that’s the case, it’s pretty much impossible to tune in to the serene state within us. The body is exhausted, and we need to sit on the couch or get a cup of coffee to recuperate. It’s somewhat ironic that by practicing yoga — a practice intended to revitalize and energize us — we can end up feeling drained. We create the opposite effect than what was intended. Yoga should be giving us life, not taking it away. We practice yoga to help us live better lives, we don’t live our lives for a better yoga practice. 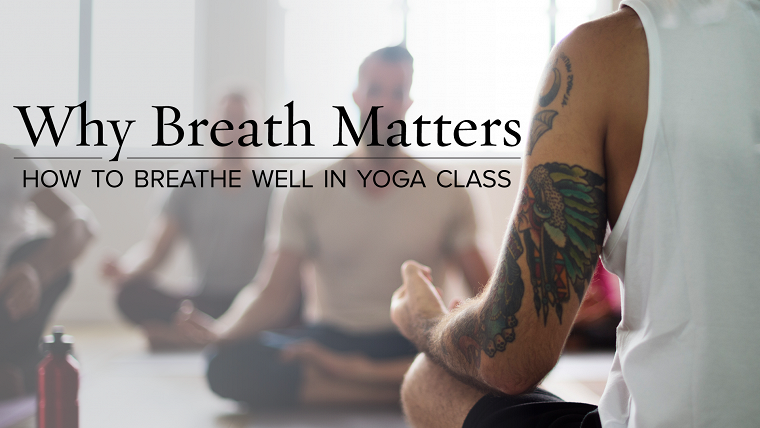 So, breathing does matter in yoga. And breath that is smooth, steady, and evenly balanced in length and application is important. Did you know that how you breathe not only helps you move optimally into a posture, but also guides the unfolding of prana and thus the release of your greatest potential? It may sound corny, but it’s true that we all have amazing potential within that for most of us lies dormant throughout our lives. For many, this is the ultimate goal of yoga — to access that potential and enhance our lives. This goes far beyond the desire for toned arms or for doing a handstand in the middle of the room. But where do we begin? How can we consciously work with the breath in a way that creates balance — that helps us to be strong and energized, yet calm and centered? A practice I return to often is sama vritti breath, a simple, potent practice that you can use both on its own and throughout your asana practice. It will help you to feel balanced and revitalized, and to create harmony in body, breath, and mind. Establish ujjayi breath by breathing in and out through your nose, as if you had the desire to whisper (but the mouth is closed, so the whisper sound passes through the nose). Check to see that your inhale and exhale have the same sound and depth. (Many people find it easier to do ujjayi on the exhale, and don’t apply it on the inhale. This can make it hard to get sufficient oxygen, causing stress on the body and leading to anxiety for the practitioner. Apply equal effort to your inhalation and exhalation, allowing both parts of your breath to hold this “victorious” quality. Establish a rhythm where your inhale and your exhale become even in duration. Now carve out a beginning, a middle, and an end to the inhale. Carve out a beginning, middle, and end to the exhale. There will then be an arc to each part of your breath. Lastly, allow a tiny space of nothingness after the inhale, and a tiny space of nothingness after the exhale. Thus, your whole attention is on inhale. And then on exhale. They never get jumbled together. Once you have mastered this while sitting, you can begin to master it while practicing your yoga poses. 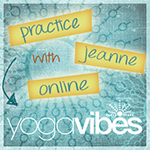 The moment your breath gets messy, pause in the poses and regain control of the steady rhythm of the breath.